Survey report for histiocytic diseases in dogs ! and all other pets who fell victim to this dreadful disease. This histio survey report is to determine the frequency and/or possible causes of histiocytic diseases in all dog breeds. It is an ongoing research, so if you have/had an histio stricken dog, please complete the questionnaire and send it to me. Warning: This report consists entirely of information provided by third parties and most respondents have not answered every question, which resulted in a lower sample size for some questions. Also this is my own interpretation of the data received. Therefore I hereby disclaim any liability for the accuracy or meaning of any such information provided in this survey report. The results of this survey should be interpreted with caution. Users hereby agree to use or rely on this information solely at their own risk. A big THANK YOU to everyone who took the time and effort to send in their answers. 87	questionnaires were filled out. 44	dogs were diagnosed with Malignant Histiocytosis (MH), 20	males and 24	females. Oldest dog in this survey who died of MH was an almost 14 year old spayed female Terrier mix. The youngest dog was an only 1 year and 7 months young spayed female Labrador/Akita mix. Average survival time after diagnosis is 11 weeks. Longest survival time after diagnosis was 97 weeks for Buddy, a 9 year old neutered male Golden Retriever. He had a splenectomy and did not get any medicines because of his sensitive stomach. Click here to read Buddy's story. 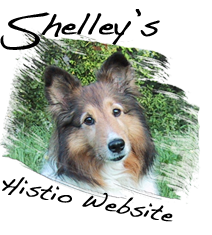 37	dogs were diagnosed with Histiocytic Sarcoma (HS), 16	males and 21	females. Oldest dog in this survey who died of HS was an almost 12 year old spayed female Labrador Retriever. The youngest dog was an almost 3 year young male Golden Retriever. 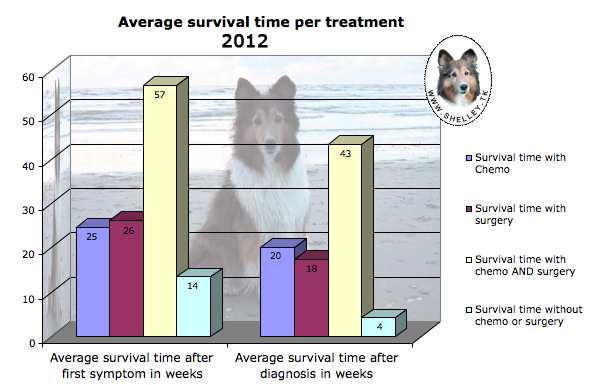 Average survival time after diagnosis is 17 weeks. CCNU (lomustine), cyclophosphamide and Doxorubicin. Click here to read Rosie's story. 6	dogs were diagnosed with Reactive Histiocytosis (RH), 4	males and 2	females. Oldest dog in this group who died was a 10 year old spayed female Beagle, diagnosed with systemic histiocytosis (SH). 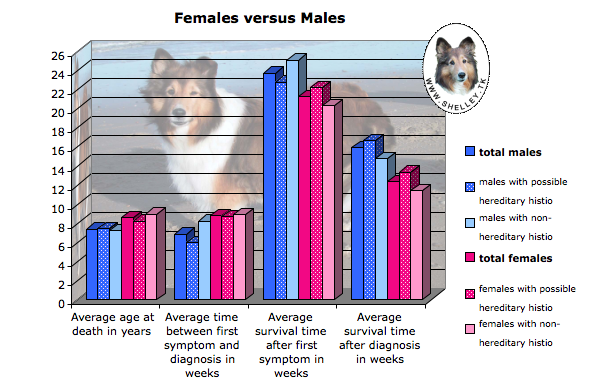 The youngest dog was an 8,5 year old intact male BMD, also diagnosed with SH. Of all	87	Histio cases, 66	dogs lived in the United States of America: 1	in Arizona, 9	in California, 3	in Colorado, 3	in Florida, 2	in Georgia, 5	in Illinois, 1	in Indiana, 1	in Maine, 1	in Maryland, 2	in Massachesetts, 1	in Michigan, 1	in Minnesota, 1	in Missouri, 2	in Nevada, 2	in New Hampshire, 2	in New Jersey, 4	in New York, 3	in North Carolina, 4	in Ohio, 2	in Oregon, 1	in Pennsylvania, 2	in South Carolina, 1	in Tennessee, 2	in Texas, 3	in Washington, 1	in Wisconsin and 3	in Wyoming. 3	dogs lived in Canada, 2	dogs lived in Australia: 1	in ACT and 1	in Queensland. 15	lived in Europe: 1	in Italy, 8	in the Netherlands, 1	in Scotland and 5	in the UK. 1	lived in South Africa. Most dogs ( 39	) came from an established breeder, 8	from a casual breeder, 9	from a backyard breeder and 12	dogs came from a shelter or rescue organization. 7	from a private party, like a friend or neighbor. 7	were from a petstore, 1	from a newspaper add, 2	were stray dogs and 2	owners did not answer this question. Some dogs diagnosed with HS had multiple tumors in different parts of their bodies. Therefore I doubt whether their actual diagnosis is correct. As for health issues in life before the onset of an histiocytic disease, multiple answers were possible. From a total of 87	dogs in this survey, 33	had no prior health issues and only 2	owners did not fill out this question. This leaves 52	dogs with one or more health issues prior to the onset of their histiocytic disease. 35	dogs had fatty tumors, 11	had orthopedic disorders, 7	digestive disorders and 9	torn ligaments/tendons. 10	dogs had reactions to drugs, 7	had allergies, 6	chronic infections, 6	parasitic diseases, 6	other tumors, 3	urinary problems, 6	reactions to vaccinations, 2	dental problems, 2	eye problems, 2	respiratory disorders, 2	seizures and 4	skin disorders. like: autoimmune disease, enlarged prostate, kidney disease, poisoned, thyroid disease, tonsilectomy, viral diseases, weight problems and wounds/cuts. From a total of 87	dogs, 44	needed no treatment prior to the onset of their histiocytic disease. 1	owner did not remember any health issues and 14	owners did not fill out this question. This leaves 28	dogs who received some form of treatment in the 6 months prior to the onset of their histiocytic disease. 2	dogs were given anesthesia and 3	steroids (Prednison). 1	dog was given 15 different meds in an attempt to control her neosporosis. 4	people didn't remember the name of the antibiotics. Other antibiotics reported only once are: ampicillin, ceferal, clavamox, flagyl, gentamicin, metrodinazole, penicillin and sulfamethazole. All these drugs were reported only once: buprenorphine, fentanyl patch, gabopentin, percocet, procaine and tramadol. 40	dogs were NOT misdiagnosed and 1	owner did not fill out this question, but the remaining 46	dogs were diagnosed with another disease while in fact suffering from a histiocytic disease. arthritis, brain tumor, broken bone, burrs in throat, cervical disc/neurological, clotting disorder, cutaneus histiocytosis, flu, heart disease, hernia, infection, kidney disease, liver cancer, muscle strain, pancreatitis, tonsilitis, tooth abcess, unknown cough, uveitus and a weight problem. Multiple answers were possible. 2	dogs presented no obvious symptoms. All other 85	dogs had one or multiple obvious symptoms. Constipation, difficulty swallowing, Enlarged heart, Enlarged Spleen, Isolation, Nasal bleeding, None responsive, Orange Urine, Reverse Sneezing, Snoring, Squinting Eye, Swollen Stomach, TIA. 1	owner did not fill out this question. In all other 86	cases, several diagnostic methods were used to get a definite diagnosis. 59	x biopsy/FNA, 39	x X-ray or scan, 38	x bloodwork, 28	x ultrasound, 11	x surgical removal of tumor and biopsy, 5	x autopsy (necropsy), 2	x histio stain. HIG test, opthalmascope, urine analysis, neurological test and the marker test. 9	dogs received no treatment at all after being diagnosed with one of the histiocytic diseases. 7	dogs were euthanized or died within a week after diagnosis, 5	dogs died before diagnosis, and 1	owner said the dog did get some form of treatment, but did not recall which kind. 24	dogs were given no other treatment than medicines. 7	dogs had cancer surgery to remove the tumor but no other treatment, 10	dogs had cancer surgery and received drug treatment after surgery, 7	dogs had cancer surgery and received chemotherapy treatment plus medication, 4	dogs had cancer surgery and chemotherapy without medication, 2	dogs received chemotherapy without any other treatment, 2	dogs received chemotherapy but the owner does not remember the exact protocol, 7	dogs received chemotherapy and medication , 1	dog got chemotherapy and radiation. And 1	dog received chemotherapy but it was discontinued after one round. 23	dogs were given chemotherapy. In some cases their vets used more than one chemo protocol. The most used chemotherapy treatment CCNU (Lomustine), was used 20	times. Other chemo protocols used are 3	x Doxorubicin (Adriamycin), 2	x Cyclophosphamide (Cytoxan), 1	x Asparaginase, 1	x Carboplatin and 1	x Vincristine. Corticosteroids and/or Immunosuppressants were used 33	times. The most prescribed was Prednisone, which was used 32	times. 1	dog was given Ciclosporin. 13	dogs were given painkillers. 3	owners did not recall the name of the medicine. The painkillers used were 3	x Rimadyl, 3	x Tramadol, 2	x Deramaxx, 1	x Cortaphen Forte and 1	x Metacam. 3	Dogs were given Narcotics: 2	x Morphine, 1	x Fentanyl Patch. Antibiotics were used 11	times and anti nausea medication 7	times. 1	dog was treated with Diazepam (Pamlin) 15	owners tried supplements like antioxidants, CAS option, Chinese herbs, herbal tea, Omega's 3+6, or vitamins. And 4	owners gave accupuncture a try. 70	people did not split vaccinations for their dog and 17	respondents did not fill out this question. 6	puppies received the combo/cocktail vaccination before they were 6 weeks old, 24	puppies were 6 to 8 weeks old at the time of their first shot, 5	puppies less than 3 months old and 4	puppies were between 3/6 months old. 48	forms had no information about the first ever combo/cocktail vaccination for the puppy. 36	dogs have received an annual booster after their first combo/cocktail vaccination, 3	dogs received a bi-annual booster, 10	dogs received that every 3 years, 3	dogs received boosters depending on titers and 5	dogs were titered and never needed a booster. Leaving 30	dogs, whose owners did not fill out this question. 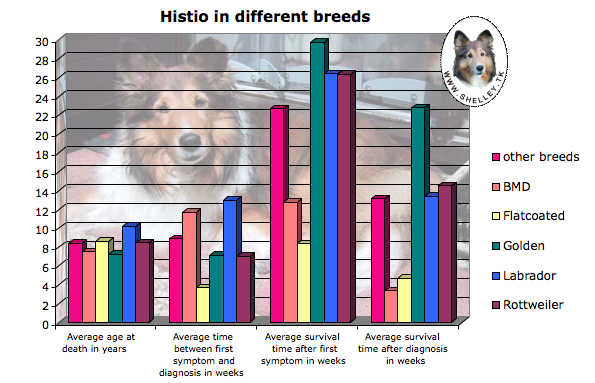 In 3	dogs the first symptom of histio showed less than one month after they received the last combo/cocktail vaccination, for 3	dogs it was between 1 and 2 months, for 1	dog it was between 2 and 3 months. For 2	other dogs it was between 3 and 6 months and in 43	dogs it was more than 6 months. 5	dogs were vaccinated AFTER the onset of histio and 30	people did not fill out this question. 3	dogs were never vaccinated against Rabies. 3	dogs received the rabies vaccination before they were 3 months old, 11	dogs were less than half a year old at the time of vaccination, 6	dogs less than 1 year old and 5	dogs were more than a year old. 59	forms had no information about the first rabies vaccination for the dog. 3	dogs were never re-vaccinated against rabies after their first shot. 1	dog received his booster shot only two months after the first shot and then again a year later. 1	dog was only vaccinated against rabies once or twice in its life. 8	dogs received an annual booster, 4	dogs every 2 years, 24	dogs every 3 years, leaving 46	dogs, whose owners did not fill out this question. In 3	dogs the first symptom of histio showed within less than a month after they received the last rabies vaccination, in 3	other dogs it was between 1 and 2 months, for 1	dog it was between 2 and 3 months, for 1	dog it was between 3 and 6 months and in 21	dogs it was more than 6 months. 3	dogs were vaccinated after the onset of histio and 52	people did not fill out this question. 11	dogs were never vaccinated against kennel cough. 2	dogs received the kennel cough vaccination when they were less than 3 months old, 2	dogs when they were less than 6 months old, 3	dogs when they were less than 1 year old and 6	dogs were more than a year old. 63	forms had no information about the first kennel cough vaccination for the dog. 1	dog got a booster every 6 months, 4	dogs were vaccinated annually and 2	dogs every 3 years 5	dogs were only vaccinated against kennel cough once or twice in their lives. 2	dogs received a sporadic booster, leaving 62	dogs, whose owners did not fill out this question. In 2	dogs the first symptom of histio showed within less than a month after it received the last kennel cough vaccination, for 4	other dogs it was between 1 and 2 months and for 11	dogs it was more than 6 months. 59	people did not fill out this question. 12	dogs were never vaccinated against Lyme. 1	dog received the lyme vaccination when it was less than 3 months old, 2	dogs received the lyme vaccination before they were 1 year old and 4	dogs were more than a year old. 68	forms had no information about the first lyme vaccination for the dog. 8	dogs received an annual booster, 1	dog only once, 12	never and 66	people did not fill out this question. In 1	dog the first symptom of histio showed within less than a month after it received the last vaccination. For 1	dog it was between 3 and 6 months. And for 5	dogs it was more than 6 months. 1	dog was vaccinated after the onset of histio, and 67	people did not fill out this question. Flea Preventative	25	Dogs received a monthly flea preventative and 11	only during the summer months. 11	owners gave their dog a flea preventative, but don't remember the protocol. 23	dogs didn't receive any flea treatment at all. 12	only sporadic, 1	only once and 4	owners did not fill out this question. The brands used were: 4	x Advantage, 4	x Advantix, 2	x Biospot, 2	x Bob Martin, 1	x Capstar, 1	x Comfortis, 40	x Frontline, 2	x Hartz, 1	x Prevention, 1	x Promeris, 1	x Revolution and 1	x Sentinel. 21	Dogs received a monthly tick preventative and 11	only during the summer months. 9	owners gave their dog a tick preventative, but don't remember the protocol. 25	dogs didn't receive any tick treatment at all. 12	only sporadic. 8	owners did not fill out this question. And only 1	dog was treated with an annual Lyme vaccination. The brands used were: 1	x Advantage, 4	x Advantix, 3	x Biospot, 1	x Bob Martin, 1	x Comfortis, 36	x Frontline, 1	x Hartz, 1	x Preventic, 1	x Orevention, 1	x Promeris, 3	x Revolution, 1	x Scalibor and 1	x Sentinel. 22	dogs received some form of heartworm preventative but the owners don't remember the protocol. 21	dogs didn't receive any heartworm treatment at all. 26	dogs monthly all year long, and 7	only during summer months. 1	dog twice a year and 3	sporadic. 6	owners did not fill out this question. And 1	owner reported that his dog was vaccinated against heartworm with Guardian. The brands used were: 1	x Advantix, 1	x Bob Martin, 1	x Hartz, 31	x Heartguard, 15	x Interceptor, 3	x Iverheart, 2	x Ivermectin, 1	x Proheart injection, 2	x Revolution and 1	x Scalibor. A majority of respondents ( 61	) reported not to deworm their dogs. In general these are dogs that already received heartworm treatment, so no regular deworming was necessary. 2	dogs received a quarterly worming prevention, 6	every half year, 4	annual and 2	sporadic. 2	owners did not remember the protocol and 10	people did not fill out this question. The brands used were: 1	x dog + cat, 1	x Bob Martin, 6	x Drontal, 1	x Excil and 2	x Milbemax. One owner reported having his dog treated against lice (Advocate) more than a year before the onset of her dogs histiocytic sarcoma. The vast majority ( 50	) of respondents fed their dogs commerical food. 2	prepared homemade meals for their dog and 8	people combined homemade meals with commerical food. 16	others fed their dogs a combination of trable scraps with commercial food. 1	person fed her dog RAW only and 5	dogs got RAW combined with commerical food. 5	people did not fill out this question. The remaining foods are all reported only once: Bakers, Blue Buffalo, Bonzo, Bravo, Butchers, Carnibest, Chickensoup for the doglovers soul, Costco, Diamond, Eagle Pack, Flint River Ranch, Friskies, Kirkland, Lucky Dog, Mark's + Spencers, Member's Mark, Nature's Domain, Nature's Gift, Nature's Recipe, Nature's variety, Pittah, Repnor Gold, Royal Canine, Scoots, Sensible Choice, Solid Gold, Summit, Taste of the Wild, Tesco, and Various. Most respondents ( 55	) indicated no supplements. The most used supplements are: 16	x Glucosamine, 7	x Fish oil, 4	x Omega 3-6-9, 4	x Vitamines, 3	x Veggies and/or fruit, 2	x Flaxseed, 2	x Maitake, 2	x Missing Link. 68	owners said they had not changed their dogs diet. And 3	owners did not remember, or did not fill out this question. 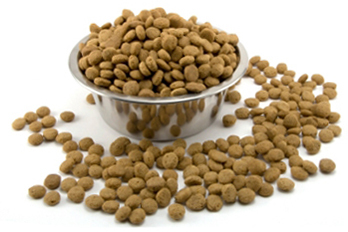 For 2	dogs the onset of histiocytic disease was at less than 1 month after the change of diet. For 1	dog it was between 1 and 2 months, for 2	dogs it was between 2 and 3 months, for 3	dogs it was between 3 and 6 months and for 6	dogs it was after more than 6 months. 2	owners changed the diet of their dog, but did not remember the time between the diet change and the onset of the histiocytic disease. 48	owners said no treatment was used and 11	did not fill out this question or did not remember. For 3	dogs the onset of histiocytic disease was within less than a month after being exposed to such a treatment. For 2	dog it was between 1 and 2 months, for 1	dog it was between 2 and 3 months, for 1	dog it was between 3 and 6 months and for 5	dogs it was after more than 6 months. 16	owners did recall the use of a treatment but did not remember the time between the use of the treatment and the onset of the histiocytic disease. 60	owners said they did not move or remodel their home and 6	did not fill out this question or did not remember. For 3	dogs the onset of histiocytic disease was within less than a month after the remodel or move. For 0	dogs it was between 1 and 2 months, for 4	dogs it was between 2 and 3 months, for 0	dogs it was between 3 and 6 months and for 12	dogs it was after more than 6 months. 2	owners did recall the remodel/move but did not remember the time between the occasion and the onset of the histiocytic disease. 67	owners said they had not introduced another pet into the household and 3	did not fill out this question or did not remember. 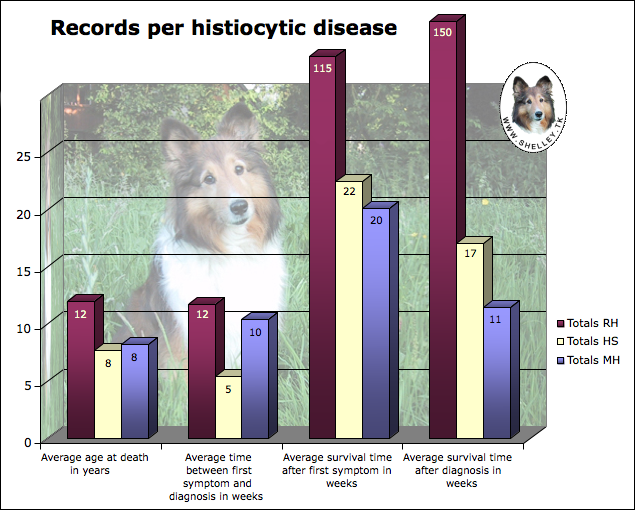 For 1	dog the onset of histiocytic disease was within less than a month after the introduction of the new pet; for 4	dogs it was between 1 and 2 months, for 1	dog it was between 2 and 3 months, for 1	dog it was between 3 and 6 months and for 10	dogs it was after more than 6 months. 0	owner did recall having a new pet but did not remember the time between the introduction and the onset of the histiocytic disease. 73	owners said their dog had never been in a kennel and 2	did not fill out this question or did not remember. 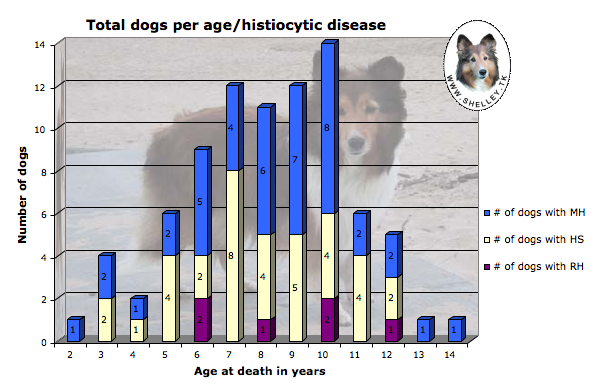 For 5	dogs the onset of histiocytic disease was less than a month and for 1	dog it was between 1 and 2 months, for 2	dogs it was between 2 and 3 months, for 1	dog it was between 3 and 6 months and for 3	dogs it was after more than 6 months. 0	owner did recall having a new pet but did not remember the time between the introduction and the onset of the histiocytic disease. One owner told me her dog always had a toy in its mouth. The toy was washed regularly in detergent 'Tide' and dried with half a 'Snuggle' dryer sheet. 87	dogs are currently in the survey. This number is way too low to draw any definite conclusions. So far it only confirms the commonly known facts about this disease, it has yet to reveal new facts. So hopefully more people will fill out the questionnaire and help us in our quest for answers.